My reaction when I read about the new smart bus was “finally a respectable way to commute in this city!”. I lived three and half years in Malaysia where I heavily relied on public transport, and since I am not a fan of driving in Egypt –who is? !- I’d like to be able to ditch my car any second and enjoy taking public transport. Thank god! However, I have to note that people share more negative stuff than positive, it’s general human nature. So if you are presenting any “new” concept to this land, on the surface crust you’d find your new product or idea rejected, or even ridiculed, but at the base lies your supporters. So don’t let this hinder you, learn from all the criticism, but at the same time find your supporters and weigh all the feedback. 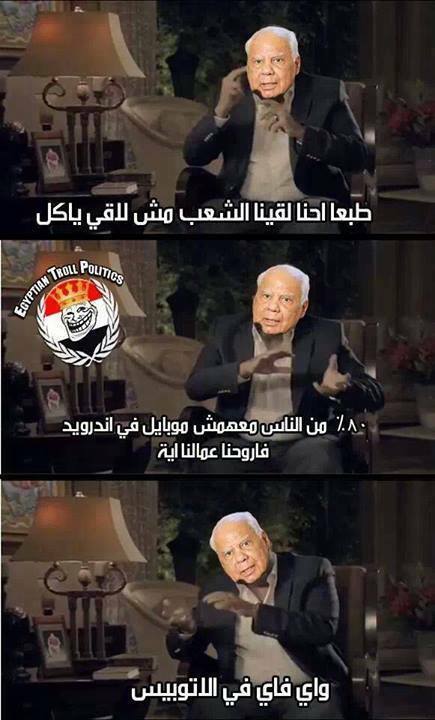 Since Egypt faces so many problems, people will always think priority should go to something else. I’ve faced this so many times as a designer, I’d try to solve a problem and during my research people would tell me “but we have bigger problems!”. Well yes there are bigger fish to fry, but we are 90 million, if each one of us directed his energy to solving only one problem it will get us nowhere. If someone offers a solution for a problem in transportation, and another in sanitation, and another in sports, then we’ll move much faster! In the Smart bus case: what’s really promoted is the free wifi, though the bus offers other major benefits like RFID tickets! This means that everything would be documented; timing, bus number, bus driver, place..etc. Prices are fixed, the number of passengers in the bus would be controlled (hopefully!). There are also audio announcements of bus stops which is a great thing, which means bus routes are predefined, which means predefined bus stops and bus schedule! (again hopefully!). That’s the basics of a public transportation system that respects its citizens. We can’t discard all this and only argue whether poor people need wifi or not, which leads to the next point. Is public transportation only for the poor? Wifi might be a luxury for a person from a low class, but it’s air for a middle and high class person. 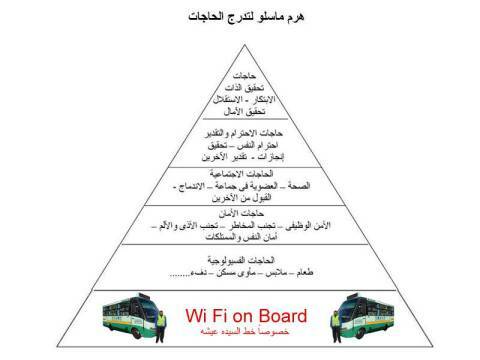 I wont ask who’s the target user of this bus, because then we’ll be empowering the layered and segregated state of Egypt. But I’d ask does this encourage car owners to take public transport? Would this help with the unbearable Cairo traffic? Would it help with offering a more sustainable environment? -I know the last one is too much, what environment! We have bigger problems to solve! The route of the bus is from Shobra to Al-Matar. The two words Shobra and wifi don’t mix, and that’s due to our perception of what Shobra is associated with, which is partly unrealistic and very irrelevant in this case. I don’t know which Matar, the one in Sheraton or giza, but in both cases the bus will be taking major routes, meaning different people from different areas will be using the bus, a point that I should not be noting in the first place. 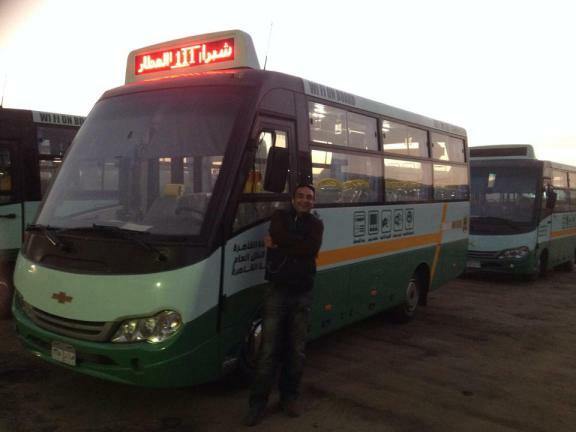 A private company named Alqahira public transportation launched the buses, the government had no hand in this. 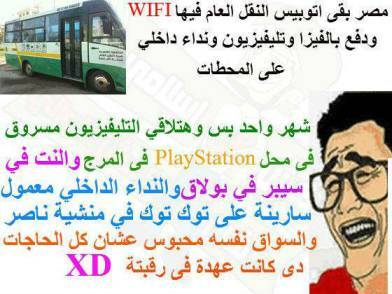 So would this fact change how you’d respond to having WIFI enabled buses in Cairo? I think it would, greatly! We can’t allow ourselves to suffer from an anti-government bias, though it is historically and currently understandable. Our attitude towards the word government is a PhD research on its own, I’d personally title it: The blob we call government. We treat the whole government as one person who should solve all our problems. How can we tell the ministry of transportation that it’s better they fix the state of national security! Let alone that this was coming from the private sector. It’s completely irrelevant; it’s like telling an office furniture manufacturer to stop making chairs and go solve our unemployment problem! I can say without a doubt that this is a huge assumption that we make. People steal and cheat for different reasons; behavioral economist Dan Ariely did many amazing experiments in this area that you’ll find very interesting. Context plays a major role; if you respect a person and value what he pays then it’s a different case. We have to see humans in a different light, if we ever want this country to change. AlShugairi’s experiment is a proof of that, it’s a must see! It took place in Egypt, and I am guessing it’s in one of those buses. As a designer, I think this will continuously be the battle that we have to fight; the unconscious contradicting attitude of Egyptians towards anything new. Egyptians, rise above the status quo.